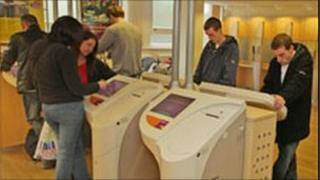 There has been a rise in the number of people claiming unemployment benefit in Northern Ireland. The number of people claiming benefit has risen to 58,500, a monthly increase of 100 in November. NI's increase was the fourth highest monthly rise in the number claiming unemployment benefits across 12 UK regions. The figures show there is a now a divergence between NI and the rest of the UK. Over the year, the Northern Ireland claimant count has increased by 8.5% compared to a fall of 9.7% in the UK. Commenting on the figures, Enterprise Minister Arlene Foster said: "It was disappointing to note the latest increase in the unemployment rate for Northern Ireland. "Nevertheless, our unemployment rate (7.6%) is still lower than the corresponding rate for the United Kingdom (7.9%) and it also compares favourably to the latest European Union (9.6%) and Republic of Ireland (14.1%) figures. "Although the figures for November 2010 show a marginal increase of 100 in the number of people claiming unemployment benefits, over recent months there has been a notable slowing in the rate of increase, with the latest monthly increase much less marked than last year," she added. "The Quarterly Employment Survey results for September 2010 also indicated a slow down in the rate of job losses in Northern Ireland. "The latest quarterly decrease in jobs was approximately one quarter of the average fall in jobs since the start of the downturn. "The industry driving this quarter's job losses was once again the construction sector, as firms continue to find economic conditions difficult," Ms Foster added. "However, on a brighter note, manufacturing companies reported an increase in jobs for the second consecutive quarter and the number of private sector jobs increased for the first time in two years."